MyUnity is a tweaking tool for the Unity desktop that allows you to tweak and customize your Unity desktop to your liking. While it doesn’t cover every possible tweaks under the sun, it does make the Unity desktop more customizable and easier to use. It can customize your unity desktop on Ubuntu 12.04 Precise Pangolin/Ubuntu 11.10 Oneiric Ocelot/Ubuntu 11.04 Natty Narwhal. I don't which is much better from your point of view 'MyUnity' or 'Ubuntu-Tweak'. You should try this out and you can decide which is more comfortable for you in Unity. 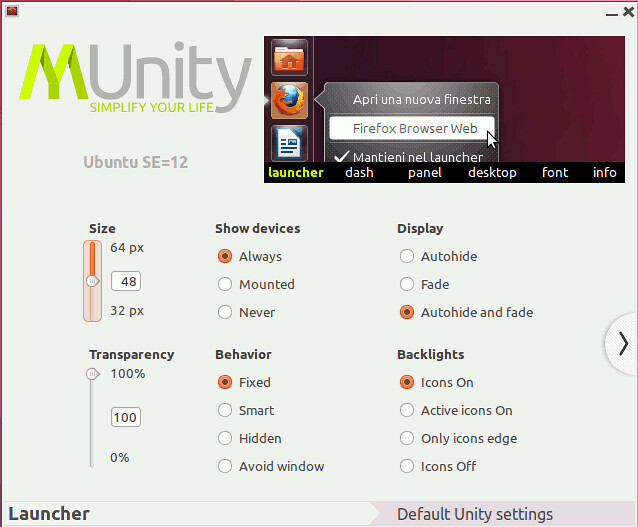 No Comment to " Tweak your Ubuntu with MyUnity on Ubuntu 12.04/11.10/11.04 "